Josh and I returned home late Sunday night from an absolutely wonderful evening with around 80 students from Roberts Wesleyan College and about 2,000 people from the Rochester area. We stepped down from a limo bus with bellies full of desserts and sparkling cider—and with hearts and minds full of a lot to consider. We were all gathered for a Night to Honor Israel. This night has caused me to look back on my life and recollect the many moments when God has tugged on my heartstrings to intercede for Israel, and when I—unable to see what the Jewish nation has to do with me—have done nothing. In elementary school, I gravitated to the stories behind kid-friendly recipes for foods like hamentaschen and challah that I would encounter in Highlights magazines. I later taught myself the Four Questions of Passover and sang them in Hebrew for a school talent show. In high school the only boy to catch my eye was my future husband whose endearing “Jew-fro” led countless strangers to inquire whether he and I were ethnically Jewish. As I grew older and my faith and theology began to become my own, my brief interactions with Israel became more serious and thought-provoking. My most beloved professor of a class on the literature of the Inklings admitted to observing all of the major Jewish holidays with her family despite being a Christian with no connection to the Jewish community. Around the same time Josh and I discussed marriage and whether we might like to adopt the same practice with our own children. Nothing ever came of it. Life went on. Three of our friends studied abroad in Israel. Josh took two years of Hebrew in pursuit of a career in linguistics. We attended a lecture on Yom Kippur solely for the free food—the week of Ahmedinijad’s speech before the UN. And then Josh forged a business relationship and dear friendship with a young man who, as a Messianic Jew, was active in Christians United For Israel on the Roberts campus. He invited us to the seventh annual Night to Honor Israel. Limo buses, ya’ll! What a hoot. I entered the packed sanctuary with the mentality that supporting Israel in some way was probably a good idea just because–who doesn’t want to support the underdog? Israel and the Jewish nation have been persecuted by a different people group in every generation throughout history. Today, the same terrorist organizations threatening the democracy of the United States want to wipe Israel off the face of the earth. I had expected to hear all of that. What I had not expected were the tragic and inspiring individual stories from the beautiful and diverse Jewish men and women praising, encouraging, and defending their Holy Land to an auditorium full of Christians. These people stood on their faith in the God who has brought them through centuries of tragedy, hoping for the blessed future of their countrymen and of the planet. Their stories brought me to tears and brought prayers for global unity from my mouth. The Hebrew lyrics to the hymn of unification “Hine Ma Tov” rose to my heart’s memory from a distant moment in my childhood, and I danced with the brothers and sisters of the nation of Israel. I believe that God has a plan for this tiny nation that will bring blessings to all the nations of the world. I don’t know what the future holds for Josh and I and our involvement with defending Israel. All I know is that I want to be a part of God’s plan for these people and, through them, for all people. So much dessert . . . Okay, so I’ve been fairly vocal on here about the fact that I’m pretty overwhelmed what with all of my classes, my internship, work, Muse, being married, being a sane person, being an at least somewhat nice person, and the like. Basically I’ve hopped over to Nine to Phive long enough to complain about everything that’s going wrong, all the while being a bit hazy on everything that’s going right. One of these such things is my simply fabulous internship at the local film studio Envision Productions. Paul, my supervisor, has taken me on all sorts of adventures with him, one of which involves filming a documentary about PUSH Physical Theatre. More on them later, but for now, suffice it to say that I am loving my job. Any day that I get to spend watching them work makes my own work seem worthwhile–and not nearly as exhausting as it could be. These guys work up sweat! However awesome this crew may be, whenever there’s a lot of sweat, there’s a chance for a lot of awkward . . . I get to work with these people . . . GAAAAAHHH . . . NOT . . . WORTHY . . . The previous two items added together means little red dust bunnies strewn around the living room carpet. Professor No. 1: Read the next four chapters of the book by Thursday. Professor No. 2: Read the last three chapters of the book by Thursday. Oh, and also these two chapters of this other book I forgot to tell you to buy. Me: AAAAAAHHHHHHH!!! Making bacon-raisin empanadas this weekend. Don’t knock it ’til you try it. That stupid Roll-Up-the-Rim-to-Win business on Tim Horton’s coffee cups. I have to use my teeth every time. The rim-rolling paid off! We won two free drinks. The cup says free coffee or latte, but they actually let you get any drink any size. Theatre dates with my love ❤ Can’t wait to see The Whipping Man in a few weeks. I know I’m a drama queen, but I don’t see any point in lying about how I feel on Nine to Phive. Especially when hardly anyone reads this blog since I’ve gotten so lax about updating it. No one will be fooled, if you know what I mean. A Muse performance at ELEV8 conference this year. I thought it was sufficiently depressing. Maybe it’s because I now have an IC flareup for two weeks out of the month. Every month. Maybe it’s because I’m scared to death that I won’t be able to keep a full-time job, let alone a job in the highly impractical field that I love. Maybe it’s because I’ve had to take a 19-credit load this semester just to graduate on time (barely). Oh, and those extra credits? They cost me $800 of over-enrollment fees. Maybe it’s because two of Muse’s biggest performances of the semester are over and I don’t feel relieved. No less busy. No less stressed. No less out of breath. Maybe it’s because, after two and a half years of marriage, I feel like I should have worked out so many of the selfish struggles that my newlywed friends seem to have no problem with after just a few months. Maybe it’s because I feel guilty turning to my family for support when they’re struggling just as much as me right now. Maybe it’s because I love God, love my church, and love my brothers and sisters in Christ, but can’t find the time or energy to invest in my personal spiritual life. Maybe it’s because I want more than anything to write freely–stories, poetry, journals, grocery lists, bucket lists, this blog–and I can’t even find time to do my required writing for class. Maybe this is my life now. I thought graduating this spring would feel like a weight being lifted, but as I approach commencement with all of this and more baggage (some of which won’t disappear the moment I walk across that stage), I feel as though it’s just a doorway into different and heavier weights pressing down on me. Pressing down on my lungs . . .
On my spirit . . .
Oh, and a drama queen. There’s that, too. Josh and I are members of the life-changing (albeit controversial) online network known as Couchsurfing. While most people would discourage sleeping on the couches of strangers in foreign cities, Josh and I can’t recommend it enough! That is, if you do it safely . . . i.e., through Couchsurfing.org where members are verified by local community leaders before they can surf or host. Basically, Couchsurfers get to spend their world travels crashing with locals for free instead of paying for a hotel. In return, you promise that if you are ever able, you will do the same for a traveler passing through your home town. After surfing with fabulous hosts in both London and Stockholm, Josh and I were finally able to make good on our promise to return the favor when a guy named Joel decided to take a bus from Toronto down to the American East Coast. I accepted his couch request when I thought he was a Canadian . . . Imagine my delight when I realized that we was natively from Sweden, the country where Josh and I left our hearts almost one year ago! Joel stayed with us for two nights. Their was sangria, beef stew, Taco Bell, late-night explorations of Wegmans, some jokes about Swedish and American stereotypes, and a lot of guy-talk about hacking computers and playing RTS games. For the record, I love Abba. They are one of perhaps three European countries that the crippling economic crisis has not affected. They must be doing something right. They have free health care, free daycare, five weeks of vacation, and paid maternity leave. No, wait! Make that maternity and paternity leave. You get fifteen months of paid vacation if your wife has a baby.Whoa. It’s basically an amazing place to work. The people are environmentally responsible, and they have acres of sparkling clean forests, air, and water to show for it. The previously mentioned forests, open air, and water. Such a unique and beautiful landscape! Pine trees and lakes everywhere. The houses all look like pictures from a country calendar. Wooden, brightly painted, and white-trimmed. They come from Vikings. But seriously, there’s a lot of history there. They embrace whole foods and good home cooking. Their pop music makes ours look like the thumping, bumping, grinding, whiny whore-fest it is. They make kids pick a “major” in high school. Talk about preparing for the future. They’re doing this about body image issues. 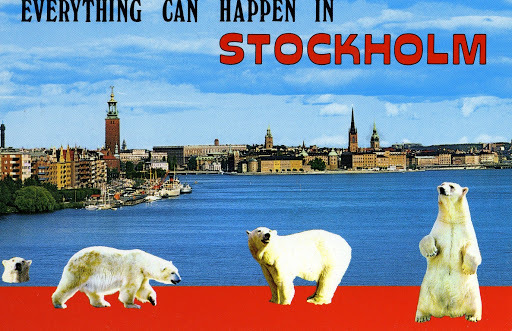 They have Stockholm. Enough said. They created the Nobel Prize.